Originally posted at my blog spin.off , while working on the book. My research has a fair amount of overlap with the Dutch Shifts in Governance NWO research programme, as it is also dealing with the control mechanisms between governments, NGO’s and private actors in national and international settings. Last month I wrote them a letter and asked them to consider to support the last year of my research, running from September 2006 to September 2007. In order to profile myself and my work I proposed some research questions that were not included in the NWO outline. You can read them in this posting. Unfortunally, the NWO contact person insisted their pot of gold was empty; if I’d have a Dutch supervisor I could give it another try elsewhere. The NWO program Shifts in Governance, problems of legitimacy and accountability greatly inspired me to carry through the idea of going back to university. The fact that the emerge of new social movements challenging the legitimacy and ‘closed’ culture of global governance and issues of new forms of governance had made it to a research program encouraged me to set up my own project, and enrol as a student at the Glasgow Strathclyde University. In short, we are moving into an era of the triple bottom line. In the past, companies looked at economic success in terms of shareholder value. Now there is a major move, driven by consumers and government, to define success by the effects on society and the environment as well as by the economics. The power of this ‘civil society’ has grown enormously, encouraged by the new means of communication. In this process of changes reputation as a major correcting mechanism is of great importance. How such mechanisms can be strengthened, and how the narrowing of accountability to one dominant shareholder can be prevented, is an important field of study for the NWO. In my opinion, this research is not complete without investigating the further and possible adverse consequences of the ‘success’ of reputation as a correcting mechanism. To assume that the effect entails of nothing but an improvement of corporations’ behavior, is far too optimistic. From a company’s point of view it is perfectly understandable to at least scan the options of evading the consequences of reputation damage, and take subsequent steps to avoid for instance a more substantive corporate accountability regime. Looking at the following set of research topics in the NWO outline (p.17), I would like to formulate several complementary questions. How can stakeholders obtain reliable, transparent information about the behaviour of business? What is the role of international organisations, national governments and various other stakeholders in this respect, for example in setting clear reporting standards and enhancing transparency more generally (by, for example, naming and shaming)? My research question would be: What will corporations do to prevent to become a subject of naming and shaming? The privatisation of public responsibilities also raises serious issues of legitimacy and accountability in a broad sense. What is the legitimacy of various groups of stakeholders who try to affect the firms’ behaviour (citizens united in nongovernmental organisations, consumers, workers) and how can these stakeholders be disciplined not to incorrectly blemish the reputations of firms? My additional question would be: what is being undertaken to undermine the legitimacy of these stakeholders? What is the role of business in this context, the role of PR companies, consultancies and other surveillance agencies? This blog is about my book Secret Manoeuvres in the Dark, events around it and future research. 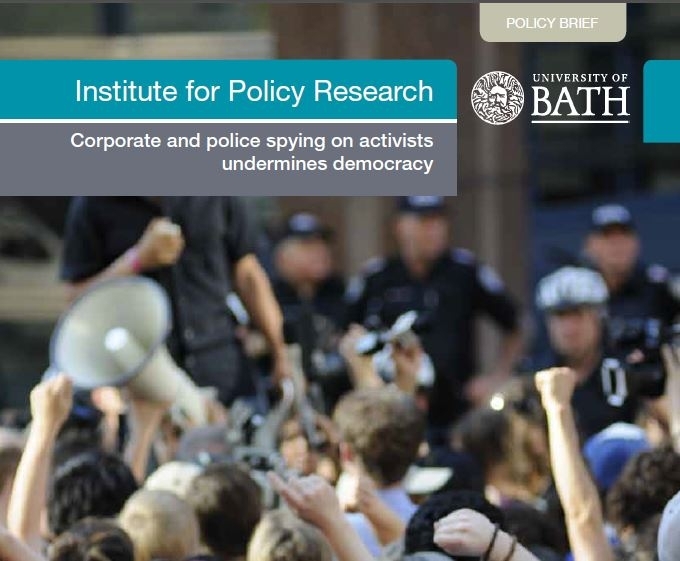 Undermining Democracy, brief for the Institute of Policy Research at the University of Bath. In this eye-opening, ground-breaking volume Eveline Lubbers opens up a new field of research. A must-read for anyone interested in grey policing, social movements, social reform and corporate intelligence behaviour. The exposure of undercover policeman Mark Kennedy in the eco-activist movement revealed how the state monitors and undermines political activism. This book shows the other grave threat to our political freedoms - undercover activities by corporations. Secret Manoeuvres in the Dark documents how corporations are halting legitimate action and investigation by activists. Using exclusive access to previously confidential sources, Eveline Lubbers shows how companies such as Nestlé, Shell and McDonald's use covert methods to evade accountability. She argues that corporate intelligence gathering has shifted from being reactive to pro-active, with important implications for democracy itself. Secret Manoeuvres in the Dark will be vital reading for activists, investigative and citizen journalists, and all who care about freedom and democracy in the 21st century. In the recent frenzy over media phone hacking, the shadow warriors of corporate espionage have escaped scrutiny, until now. Eveline Lubbers' book shines a timely and sharp light on the dark arts of serving and retired cops, spooks and squaddies who are spying, bugging and lying for big business with impunity. Blacklisted the book is out.